Most people have seen those legalese-laden copyright notices in their Facebook feeds that crop up from time to time because of a Facebook chain status post hoax that went viral. All you have to do is copy and paste the update, and either great things will happen or bad things will not happen. They may appeal to your emotions, but these notices are not real. 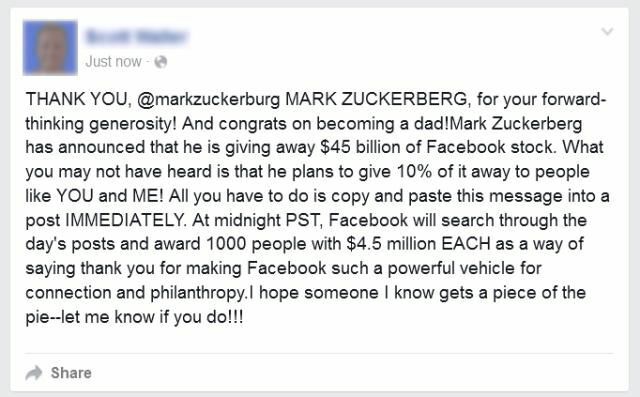 What Are Facebook Chain Letter Status Updates? Remember chain letters and chain e-mails? A few years back you couldn't open your inbox without seeing an email claiming that Bill Gates was giving away money and he wants you to send the email to all your friends so that they can get some free money, too. Some chain letters were said to bring you luck if you forwarded a copy to several people. Other chain emails preyed on fear or superstition, claiming that something bad would happen to you if you broke the chain. Some malicious chain emails even carried Trojan horse malware as attachments, resulting in rapid widespread infections due to these messages' viral nature. Chain status updates were the next logical evolution of the traditional chain letter. The messages are the same, but social media is the new bearer of non-news. A chain status update is any status update that has a statement in it that asks you to repost the status update as your own, or asks that you post it on the wall of several friends. Some of these updates are well-meaning inspirational quotes, some tug at your heartstrings, but they all have the text in them that says, "Please copy and paste this as your status for the next three hours," or something to that effect. Why Do People Create Chain Messages on Facebook? Sometimes people really like what the original post had to say or maybe they just want to see how far the post will spread. The chain post may be part of a multilevel marketing scheme, or it could be someone's attempt to spread malware or phishing links. Whatever the reason, chain status updates are here and are likely here to stay. Increasingly, chain messages (even if they don't explicitly contain a request to repost) address controversial political themes. Concerns about advocacy groups and nonstate actors trying to manipulate public sentiment through inflammatory, misleading, or outright false posts — which are then eagerly shared — are warranted. Think carefully before you forward any social media post. How Can You Spot a Harmful Chain Status Update? If the chain status update asks you to click on something, visit a link, or provide personal information of some kind, the chain status update is likely a malicious one. Don't visit the site advertised in the chain status update, and don't repost it to your status or anyone's wall. If you think your friend's Facebook account has been hacked and that someone is posting from that person's account, alert your friend by phone or some other means other than Facebook messaging. How Can You Stop the Spread of These Updates? Recognizing chain posts for what they are is key to preventing their spread. The important part of the post is that little bit of text at the end that says, "Copy and paste this," or "Place this in your status." A post that asks you to repost it is a chain. It's that simple. Unless it's a harmless inspirational-type of chain status update that you find amusing and something in you just can't resist reposting it, don't repost anything just because you're asked to do so. That's the safest approach for everyone involved. Watch out for Facebook-circulated quizzes that involve activities such as, "Answer these questions and post them, and I'll do the same." What you're really doing with this seemingly harmless posting is offering a public listing of typical security-question answers for your bank or other important accounts. Most chain status updates are harmless other than wasting time and bandwidth. The Facebook hoax is a good example of time-wasting content in the form of a chain status update. We may never know the goals of people who post these hoaxes, but you can help stop spreading them.